Type VIIC submarine U-570 which looked almost identical to U-1053. German submarine U-1053 was a Type VIIC U-boat of Nazi Germany's Kriegsmarine during World War II. The U-1053 was laid down on 8 February 1943 at the Germaniawerft yard in Kiel, Germany. She was launched on 13 January 1944 and commissioned on 12 February 1944 under the command of Oberleutnant zur See Helmut Lange. Her U-boat emblem was Crossed Swords. When she was completed, the submarine was 67.10 metres (220 ft 2 in) long, with a beam of 6.18 metres (20 ft 3 in), a height of 9.60 metres (31 ft 6 in) and a draft of 4.74 metres (15 ft 7 in). She was assessed at 864.7 t (851 long tons) submerged. The submarine was powered by two Germaniawerft F46 four-stroke, six-cylinder supercharged diesel engines producing a total of 2,800 to 3,200 metric horsepower (2,060 to 2,350 kW; 2,760 to 3,160 shp) for use while surfaced and two AEG GU 460/8-276 double-acting electric motors producing a total of 750 metric horsepower (550 kW; 740 shp) for use while submerged. She had two shafts and two 1.23 m (4 ft) propellers. The submarine was capable of operating at depths of up to 230 metres (750 ft), had a maximum surface speed of 17.6 knots (32.6 km/h; 20.3 mph) and a maximum submerged speed of 7.5 knots (13.9 km/h; 8.6 mph).When submerged, the U-boat could operate for 80 nautical miles (150 km; 92 mi) at 4 knots (7.4 km/h; 4.6 mph) and when surfaced, she could travel 8,500 nautical miles (15,700 km; 9,800 mi) at 10 knots (19 km/h; 12 mph). The submarine was fitted with five 53.3 cm (21 in) torpedo tubes (four fitted at the bow and one at the stern), fourteen torpedoes, one 8.8 cm (3.46 in) deck gun (220 rounds), one 3.7 cm (1.5 in) Flak M42 and two twin 2 cm (0.79 in) C/30 anti-aircraft guns. The boat had a complement of 44 to 57 men. U-1053 was used as a Training ship in the 5th U-boat Flotilla from 12 February 1944 to 31 October 1944 before serving in the 11th U-boat Flotilla for active service on 1 November 1944. The submarine was fitted with a Schnorchel underwater-breathing apparatus in March 1944. During her active service, U-1053 made 1 patrol. She left Horten on 7 November 1944 and patrolled a large part of the Atlantic Ocean before arriving at Stavanger on 21 January 1945 after a patrol of 76 days. In total U-1053 spend 81 days at sea. The U-1053 left Bergen, Norway on 15 February 1945 and arrived the same day in the North Sea in the Byfjord, North-West of Bergen. She was there on a diving trial, after an overhaul in the naval yard at Bergen, the submarine was forced to carry out her diving trials in the Byfjord. There were 38 crew members on board including the commander and 7 Norwegian engineers and foremen from the naval yard. The U-1053 dived normally, but after this first dive there must have been an accident aboard. When the submarine surfaced, her bow suddenly stuck up into the air at a steep angle and the submarine sank quickly in the sea stern first. Other boats came to the scene and even heard knocking from the inside of the submarine from the trapped crew. The submarine sank to a depth of 340 metres (1,120 ft) taken all 45 crew, engineers and foremen with her. The accident was probably a result of an operational error at the Snorkel facility, but sabotage was also suspected. The wreck of U-1053 was located at 60°26′N 05°16′E﻿ / ﻿60.433°N 5.267°E﻿ / 60.433; 5.267 on 18 March 2010 and her discovery was announced by the Norwegian Navy. The wreck is broken up into several pieces which indicates that the submarine hit the sea floor at a high speed. ^ a b Hofmann, Markus (2 January 2014). "U-1053". Deutsche U-Boote 1935-1945 - u-boot-archiv.de (in German). Retrieved 7 April 2016. ^ a b c d e Helgason, Guðmundur (1995). "U-1053". 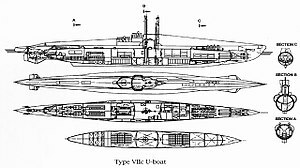 German U-boats of WWII - uboat.net. Retrieved 7 April 2016. ^ a b "U-1053 (+1945)". wrecksite.eu. 29 November 2009. Retrieved 7 April 2016. This page was last edited on 12 April 2018, at 18:47 (UTC).